Trauma-Sensitive Mindfulness with David A. Treleaven, Ph.D. But the basic signs are, at the upper level of the window of tolerance, one becomes hyper-vigilant, super anxious and has physiological reactions like sweating, flashbacks. It's basically that feeling of it's too much energy in the system. On the lower end, it can be more dissociative like, "I'm super tired. I can't remember. My cognitive processing becomes a little bit disorganized." So that's ... Those are the thresholds, and at either end, you start to notice like, "Whoa. I'm either chucking out or this is too much," and that's what you can track. And in light of that, because of the trauma and the overwhelming experiences we might have, the breath...the breath can sometimes, for some people, actually not be a neutral place to bring one's attention back to. And this gets into the interplay between the sympathetic and the parasympathetic nervous system, where sympathetic is the accelerator in many ways, allows us to really mobilize energy, and the parasympathetic is the brake. And usually, these are moving together. When we have trauma, these get a little bit out of whack, and the breath is a key place that we are actually modulating that. So for people that have experienced trauma, traumatic stress, often ... I mean, and a perfect, a good example would be, if something that was really scary, we do this, right? Like, "Huh." Would catch in. Or if we're freezing or we're trying to just contain, the energy the breath is a great way to do that, and there are these imprints and markers, like you said earlier, that happened in the body when we have an overwhelming experience. All to say, when you ask someone to pay attention to the breath in a very consistent way over, say, 15, 20, 30 minutes, that can often elicit some of the older traumatic responses that were connected to an overwhelming event." Please watch or listen on iTunes, Podbean, or Youtube. Be sure to subscribe, rate and/or review the Mindfulness & Grief Podcast so we can keep providing quality content! Heather Stang interviews David A. Treleaven, Ph.D., author of "Trauma-Sensitive Mindfulness," for an closer look at the intersection of grief, trauma and mindfulness, so you can understand the benefits and pitfalls before you practice. Mindfulness meditation is highly praised for helping people reduce physical, emotional, and psychological suffering. 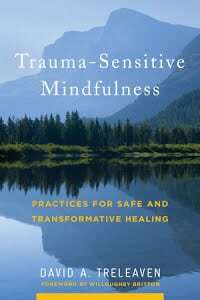 But when trauma is involved, mindfulness needs to be handled with care, modified, or outright avoided.